PHOTO BY MATT DETURCK A Ghirardelli brownie from Acanthus cafe. 319-5999, acanthuscafe.com | Monday 11 a.m.-4 p.m.; Tuesday-Wednesday 11 a.m.-10 p.m.; Thursday 11 a.m.-midnight; Friday-Saturday 11 a.m.-2 a.m.
A few days before Christmas, my newborn dining companion and I were having lunch at Acanthus Café on East Avenue. She was having breast milk. I was enjoying an uber-fresh plate of chicken salad and a bowl of steaming hot mushroom soup while entertaining a hope that there might be massive brownies full of fudge and caramel for dessert. The restaurant was quiet, only a scattering of diners were still there wrapping up a late lunch before hurrying out into the snowy afternoon. The baby stayed asleep. Apart from the lack of a brownie — the last one had left with another customer — it was a perfect lunch. Flash back to the previous weekend, two days before the baby was born. My 8-year-old dining companion, my then-pregnant wife, and I were having dinner at Acanthus, playing Apples to Apples while sharing plates of potato skins stuffed with bacon and cheese, a salad full of bleu cheese, pears, and candied walnuts, a transcendent bowl of cream of broccoli soup, and a burger. The first real snow of the season was already starting to fall. Acanthus can, often, accommodate many of your basic needs, and sometimes anticipate needs you didn't know you had — like games to keep a restless dining companion occupied while he waits for dinner, or a new set of silverware between courses. At a bit under 6 months old, Allison Mayer's Acanthus Café is an ambitious undertaking for the East and Alexander neighborhood. Neither coffee house nor rowdy bar like many of its neighbors, but hoping to attract some subset of both crowds, the restaurant incorporates elements of lounge and coffee shop along with some of the trappings of a fine-dining establishment. The dining room sports incredibly high ceilings, but the way the space is lit and painted you might never notice. It feels cozy and a little eclectic in a hip way, the undulating bar topped with inset bits of stone and recycled porcelain, the tables and chairs stylishly mismatched. Mayer has even absorbed elements of her former coffee shop, Upper Monroe's Living Room Café, into the design, devoting a red-painted back room to comfy leather chairs and couches, and a bookshelf chock-full of board games and popular novels. As you might expect from a place that tries to be all things to all people, Acanthus does some things very, very well and others a bit less well. Service on my first visit was almost stunningly good, our server even going so far as to replace our silverware between courses (something I always appreciate and did not at all expect in this setting) and getting the kitchen to split a shared salad without me having to ask her to do so. The service on our second visit was both less efficient and more intrusive; all the dishes we ordered were delivered at the same time, water glasses went unfilled, and dirty plates stayed on the table right up until we asked for the check. Happily, on my third visit things improved dramatically. Manager Rob Braden waited on us himself (it was a slow-ish afternoon and he was holding down the front of the house) with an easy affability that made two sleep-deprived parents of a newborn both relaxed and very happy. By and large, the food that comes out of Acanthus' kitchen is quite good — but again, not all things are equally good. 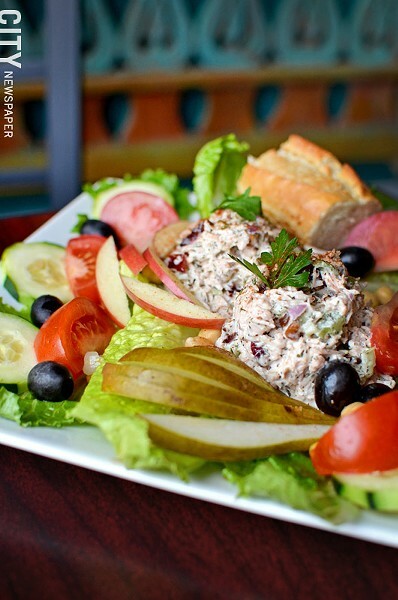 The restaurant's chef excels at appetizers, soups, and salads. His entrees, though, were less than spectacular. 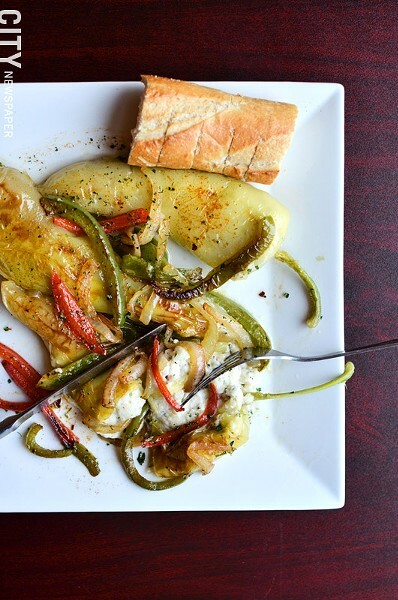 On our first visit, we started with pan-seared banana peppers stuffed with ricotta and mascarpone topped with gorgeously caramelized onions and sautéed red and yellow peppers ($5.99). The dish was far more interesting and complex than appearances suggested. The sweetness of the onions and peppers highlighted the creamy-salty cheese, which in turn was leavened by the subtle heat and meaty texture of the banana peppers. Stuffed potato skins ($6.99) filled with mashed potato and a bubbly mixture of cheese, sour cream (or perhaps even crème fraiche, it was hard to tell), and generous bits of crispy bacon were similarly wonderful, and a real treat on a cold afternoon. Less good was a marinated pork tenderloin and mango skewer served atop an indifferent salad of orzo and vegetables dressed with vinaigrette ($10.99 for three skewers). The pork was tough and a bit dry despite the marinade in which it had been soaking, and lacked a general sense of having been grilled. On our second visit, it was also the entrée that disappointed: a "Doc Yager" burger (presumably in honor of the eponymous tattoo shop next door; $7.99) was bone dry and topped with far too much gooey cheddar, the bun too large, and the advertised mango salsa entirely absent. Happily, everything else we had for dinner that night was wonderful. A bowl of cream of broccoli soup (and the bowl of cream of mushroom I had on a subsequent visit) rescued those casserole staples from Campbell's, showing a depth of flavor and careful attention to teasing out the best from each ingredient that transformed the mundane into the sublime. On my first two visits, I avoided the chicken salad plate ($5.99). This was a mistake. The chef at Acanthus creates a light and brightly flavored dressing of mayonnaise, shallot, honey, tarragon, a bit of citrus, and dried cranberries for color and a bit of sweetness. The result is closer to a cold Thai salad than the bland mess usually stuffed between two pieces of white bread. Attractive to look at, it was even better to eat, and delightful scooped up in scraps of Romaine lettuce leaves. Being a former coffee-shop owner, Mayer excels in desserts, offering an array of tasty sweets. None are better than the Ghirardelli brownies with caramel ($2.50). Fudgy and dark, but not too sweet, heated for a few seconds they become what my wife described as "the perfect food" for both chocoholics and those who want to keep them happy through long sleepless nights of nursing.